Not quite Rosie from the Jetsons but just as cute are the adorable little robots in the Get in Gear set. And just like a robot to be prepared for all sorts of occasions. 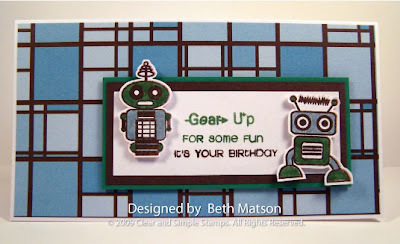 Use any of the 15 sentiments or the border stamp to create fun projects. I'll be back with another post today for the SOTM Template. There's a cute little robot in store for you this month. fantastic card, love the paper and layout of the card. Fabulous masculine card! 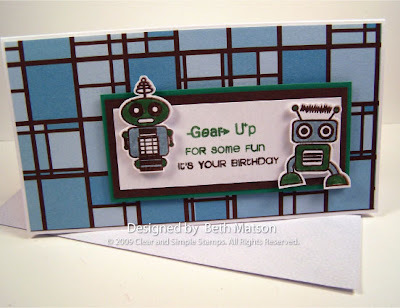 The retro patterned paper is a perfect match for the robot images.